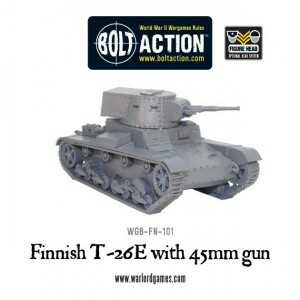 Warlord Games is finished creating their Finnish T-26E light tank and so it's now available in their webshop. Support your brave Finnish soldiers with this T-26-E Vickers 6-tonner light tank. Ordered from the British Vickers company, only a handful of Finland’s Vickers 6-tonne tanks were ready in time for the Winter War against the Soviet army with only 26 surviving the war. These remaining light tanks plus many more that were captured from the Finn’s Soviet foe had their optics and turret armament replaced with captured Soviet 45mm guns and co-axial machine guns.